Whether you use yours for laundry, as a family room or a wine cellar, basements can be damp and musty places. You need a floor that can handle a little humidity. Or a lot. If dampness is an issue, your best bet is ceramic tile or LVT/WPC. Both of these are the most highly recommended for spaces where moisture is present. Both can handle wear and tear. Both clean up easily. Both are suitable for DIY. The biggest difference may come down to price with ceramic being much more expensive. 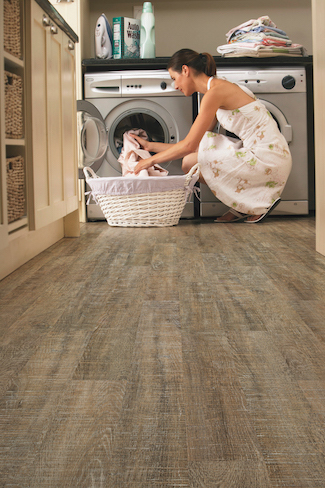 But if you’re looking for the best bargain, then vinyl, LVT/WPC are your go-to options. But basements have also come a long way, often serving as an entertainment space away from the kids, a man cave, craft room or any other creative use you can come up with. If moisture is not an issue, feel free to use laminate, engineered hardwood, cork, bamboo. Carpet can and does work in basements but it is prone to mildew. Carpet also has a tendency to trap odors which may be unavoidable in basements.